Pencil and brown pen on paper, 28,7 x 37,8 cm. In this charming little sketch, Marstrand has drawn the central female dancer and tambourine player in the large work, Romans Gathered for Merriment at an Osteria, which also belongs to The Nivaagaard Collection. He has initially sketched them free hand with a soft pencil line, and subsequently drawn them up in pen. From the pencil sketch, it is clear that Marstrand has tentatively drawn the dancer’s foot in several different positions, including the outermost, which he subsequently transferred to the painting. Marstrand is perhaps the Golden Age painter from whom we have received the most drawings. There are numerous studies, sketches and finished drawings from his hand, many of which can be considered small, independent artworks in their own right. 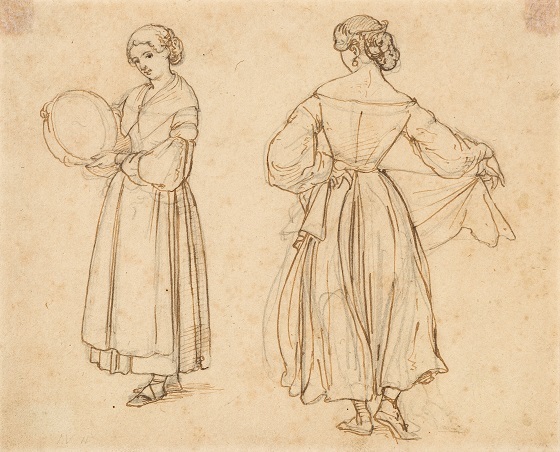 This sketch of the two women has been used as a tool in the working process to build up the image and determine the positions and motions of the various figures. Figure study for Dancing Roman Woman.